Today marketers are using technology not only to elevate user experience but also to increase client growth and improve customer retention. However, when it comes to communication between marketing and tech, finding common ground can be a bit tricky. Diverse backgrounds and experiences sometimes cause misunderstandings that ultimately lead to ineffective product development. So we turned to our Project Manager here at Tesonet, Gabrielius Blažys, to talk about what can be done to close the gap between these two departments. According to Gabrielius, one of the common issues is that these two teams are not aligned from the beginning. “Marketers almost always want everything “yesterday” while techies usually work on their own pace and sometimes find it hard to adjust to the ever-changing requirements”, he explains. This different work pace, mentality and understanding of priority creates a barrier between the two teams. That’ why it’s crucial to make sure that both marketing and tech not only have and follow the same vision but actually work together on creating it. One of the best ways to do that is by building roadmaps together. 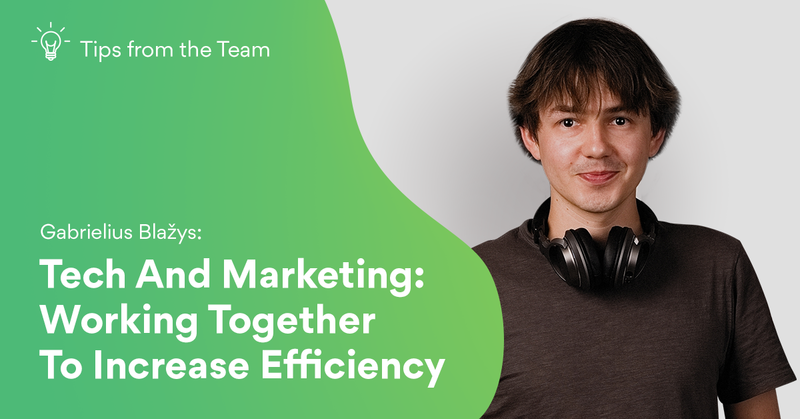 “They are great because then you have marketers discussing the strategy to fulfil user needs while the tech team helps you to prioritize them based on the technical requirements”, says Gabrielius. Usually, marketing comes in with a list of features that need to be developed, but they can’t always comprehend all the technicalities that go in. Developers help to understand that there are several steps to get to that feature and they can offer a better or a more efficient solution. When there’s a clear vision that both teams remember, it’s much easier to prioritize work and stay efficient. A common misconception is that tech and marketing are fundamentally different. But they are just driven by different things. While marketers spend most of their time putting themselves into users’ shoes, techies focus on making sure that the whole infrastructure is safe, secure and properly working. When they understand that their work areas might vary, but the end goal is still the same – to exceed users’ expectations – the whole attitude changes instantly. “As a Project Manager, I try to make sure that everyone feels empowered to make their own decisions and, if needed, I push them into the right direction”, shares Gabrielius. According to him, teams usually just need to recognize the importance of each others’ work. Developers should be more involved in discussions about users, so they could better understand who is using their developed solutions. And marketers could look for more ways to include tech expertise into their decision-making processes. In this digital day and age, communication is sometimes minimized to just having Slack channels for different topics. However, as Gabrielius points out, nothing will beat the face-to-face communication. Weekly updates, meetings with both marketing and tech, sharing progress and bottlenecks with each other – all this just minimizes the barrier between the teams. “This offline communication is essential for two reasons. One is that some things can be resolved faster when you get people together in the same room. Another reason is that you get to see the reaction and learn how to better convey your message”, he explains. But this applies not only to discussing and solving work problems. Gabrielius tells that it’s important for teams to do social activities together. “Team buildings, small talk about non-work related stuff while making coffee – these things are important as well. All these seemingly small steps minimize the anxiety around each other and open new opportunities for better communication”, says Gabrielius. The ultimate goal is to create products that users would be wowed about. For this reason, it’s essential for marketing and tech to walk hand in hand. All they need is just to find a way of communication that works the best for them and leads to the best results. Whether it’s simply changing the planning process or spending some more time together as a group – all this can make a huge difference.